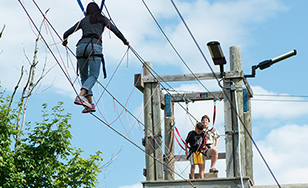 A ropes course is part of the activities at the Youth Theology Institute. The organizers of the College's Youth Theology Institute are now gearing up for summer of 2017. "I was inspired by the meaningful conversations, enthusiastic engagement, and new knowledge gained by last summer's students," said Denise Starkey, Institute Director and chair of the Theology and Religious Studies Department. "We believe that this institute and the young people we are working with are an extension of the College's mission. We're looking forward to another successful experience next summer, as we once again help students discover their gifts and the world's needs." The Sacred Word, Sacred World, Sacred Call Institute offers theological resources for finding one's calling in life and work. Last July, 18 high school students took part in the 10-day inaugural institute. The program is led by St. Scholastica theology professors, student mentors, campus ministers, and area spiritual leaders. It combines outdoor activities with opportunities for the participants to reflect on their faith. Students also take part in service learning at local nonprofits. Itzy Rocha, from Cristo Rey Jesuit High School in Minneapolis, became interested in the Institute when she heard it involved outdoor activities she'd never tried before, like rock climbing and canoeing. But her experience proved to be much more meaningful, as she reflected on some powerful questions. "They had us talk about - ‘Why were you born? What's your role in this world?'" Rocha said. "You realize that you are supposed to use your gifts for other people, for the world." The institute helped Rocha's interest in photography evolve into a possible career path involving photojournalism and social justice. Joselyn Sol Lopez, also from Cristo Rey, had a similar revelation. "I want to become a pediatrician," she said. "The theology program helped me to become more focused on that career. I want to help people." The College was awarded a $600,000 Lilly Endowment grant to establish the institute. The grant is part of Lilly's High School Youth Theology Institutes initiative, which encourages young people to explore theological traditions, ask questions about the moral dimensions of contemporary issues, and examine how their faith calls them to lives of service. The 2017 Youth Theology Institute will be next July 7 to 16. Applications are being accepted now and there is a $50 registration discount for students who register by April 15. For details, visit css.edu/goyeti.